Make delicious and nutritious Roast Chicken Bone Broth for Pennies a Jar...And discover the secret ingredient to making the best broth ever! In my last blog post, I shared with you how I love to make a Simple Roast Chicken. 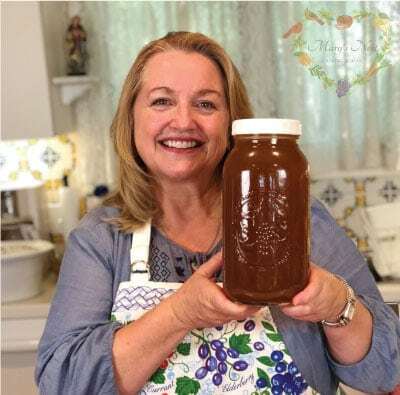 And now, here I share with you how I make Roast Chicken Bone Broth for pennies a jar with the leftover chicken bones and carcass…and a secret ingredient!! Or what I like to call the pièce de résistance…otherwise known as chicken feet!! Adding these little gems will make the most gelatinous chicken bone broth. I like to make bone broth because it makes me feel virtuous. I basically make use of scraps that many cooks might otherwise throw out. But by harnessing the last bit of goodness from bits and bobs around my kitchen, I can create a delicious broth that is rich in nourishing minerals and gelatin and can be enjoyed simply by itself or as a base for tasty soups, stews, gravies and sauces. It’s actually quite amazing when you think about it. Nothing more than scraps that virtually can serve as the back bone of a home cook’s arsenal of flavor. Although I am providing a “recipe” for this bone broth, this really is the sort of thing for which there isn’t a specific hard and fast recipe. There is a lot of flexibility when it comes to making bone broths of any variety. As to Roast Chicken Bone Broth – How many chicken carcass you use, and what chicken scraps you throw into your stock pot, can be a bit variable. So by all means, customize this recipe and make it your own. And certainly, chicken bone broth can be made from a raw chicken but when you use the carcass and scraps from a roast chicken, the flavor of the broth will be so much richer. This is my favorite way to make chicken bone broth. Now, that said, I usually use more than one chicken carcass. After each time I roast a chicken, I store the carcass in my freezer in a container that holds about 3 carcass along with their scraps. Once the container is full, I make the bone broth, adding in a few chicken feet for a boost to increase the gelatinous consistency of the final product. You can make this with just one carcass but I suggest that you wait until you have at least two. However, that said, if you have only one carcass but you have some chicken feet, wings, necks, or backs, you can make bone broth with just one carcass. Along with the three carcass’, leftover chicken skin, and scraps, I also like to add aromatics that include onions, carrots, celery, bay leaves and peppercorns. I use both fresh aromatics as well as various cooking scraps I have saved over time which I have thrown into a bag in my freezer. I do not add garlic. I think garlic can leave a bit of an off putting taste after a long simmer, so it can be best to add that later when using the bone broth for soup or whatever purpose you choose. So once you have amassed a collection of chicken carcasses, skin and scraps, along with some aromatics (and aromatic scraps if you have them) you are ready to make Roast Chicken Bone Broth. All you need now is some water and a small amount of some type of acid. I like to use white vermouth as it adds a bit of pleasant flavor to the final product but a simple splash of apple cider vinegar will do the trick just fine. Although you may have heard that you need to simmer this bone broth in-the-making for three days on your stove-top, that really isn’t the case. Approximately 6 hours is sufficient to leach the nutrients out of the bones and create a nice gelatinous broth. Excessive simmering can actually “break” the gelatin creating a watery broth which, in my – humble – opinion, has a bit of an overly strong – almost “over cooked” flavor. So make things easy on yourself and simmer this for 6 hours and then strain it. If after straining it, you think the carcass’ and scraps may render more bone broth, you can of course re-use them for making a second batch. As a final note, I want to mention that you can simmer this broth on the stove top or in a slow cooker. However, if you use a slow cooker, you will need one that has a “Keep Warm” setting that heats to 180 F. (You can test this by filling your slow cooker with water, set it on Keep Warm and test the temperature with a cooking thermometer after a few hours.) This temperature will create the perfect environment for making delicious, gelatinous bone broth. If your slow cooker does not have a “Keep Warm” setting, you can still use it to make bone broth but you will need to use the low setting and adjust the lid slightly to one side to allow for some of the heat to escape so as to prevent the broth from boiling. 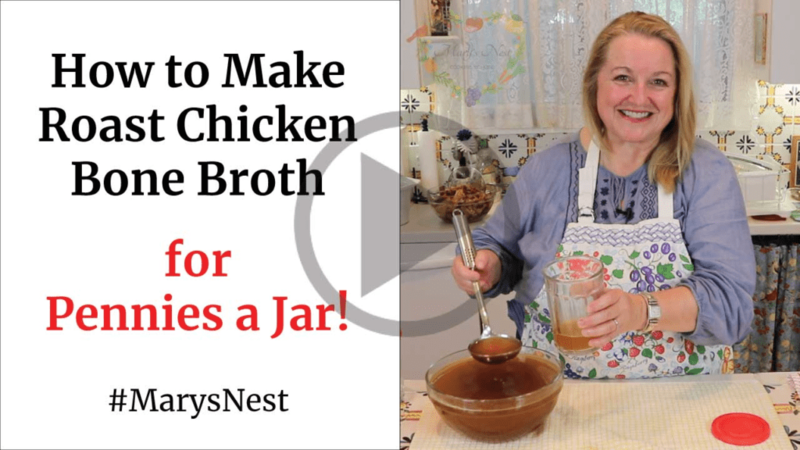 And once you master making Chicken Bone Broth from a Roast Chicken, be sure to check out my video about how to make Beef Bone Broth where I share the best bones to use to get the richest and most gelatinous broth! Place all the ingredients into the slow cooker or stock pot. If you choose to use the white vermouth, you can omit the apple cider vinegar. Add water to the slow cooker or stock pot just to cover all the ingredients. If using a slow cooker, turn it to the high setting for one hour, then turn it down to the keep warm setting and allow to simmer on keep warm for six hours. If your slow cooker does not have a keep warm setting, turn it down to the low setting but tilt the slow cooker lid to allow for some of the steam to escape to prevent the broth from boiling. If using a stock pot on the stove, bring to a boil and immediately reduce heat to low and simmer for six hours. After six hours, turn off the slow cooker or stove. Allow broth to cool slightly and then begin to strain ingredients with a slotted spoon. Reserve ingredients to be reused to make a second batch of broth. Once all the ingredients have been strained from the broth, line a colander with cheese cloth or a flour sack towel and place over a deep pot. Use a ladle to transfer broth from the slow cooker or stock pot into the lined colander. The broth will drain through the lined colander into the deep pot. Once all the broth has been strained through the lined colander into the deep pot, transfer this pot to the refrigerator until the fat rises to the top and congeals. Skim off this fat and transfer it to a separate container to be used in other recipes. Transfer the broth to container(s) with a cover that can then be refrigerated or frozen. You can store the broth in multiple smaller containers or one single large container depending on how you plan to use it. This bone broth will stay fresh for 3-4 days when refrigerated. If frozen in the freezer of a refrigerator, it will stay fresh for 6 months. 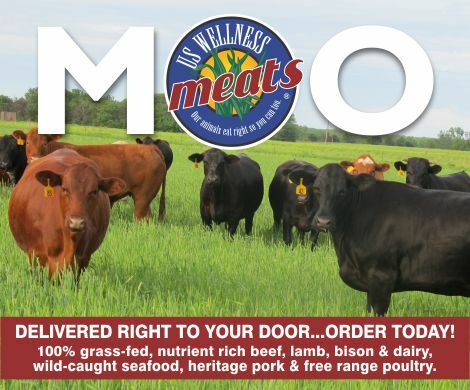 In a separate freezer that is not opened frequently, it will stay fresh for up to 12 months. Although I am providing a “recipe” for this bone broth, this really is the sort of thing for which there isn’t a specific hard and fast recipe. There is a lot of flexibility when it comes to making bone broths of any variety. As to Roast Chicken Bone Broth - How many chicken carcass you use, and what chicken scraps you throw into your stock pot, can be a bit variable. So by all means, customize this recipe and make it your own. Although you may have heard that you need to simmer this bone broth in-the-making for three days on your stove-top, that really isn’t the case. Approximately 6 hours is sufficient to leach the nutrients out of the bones and create a nice gelatinous broth. 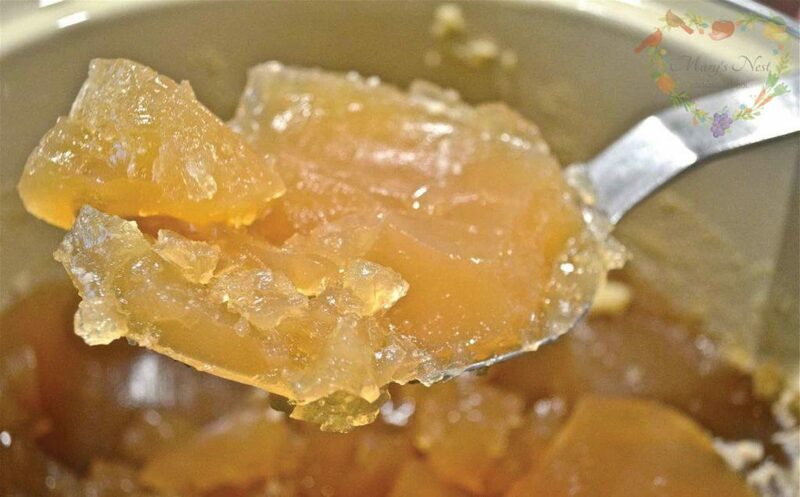 Excessive simmering can actually “break” the gelatin creating a watery broth which, in my—humble—opinion, has a bit of an overly strong - almost “over cooked” flavor. So make things easy on yourself and simmer this for 6 hours and then strain it. If after straining it, you think the carcass’ and scraps may render more bone broth, you can of course re-use them for making a second batch. If your slow cooker does not have a “Keep Warm” setting, you can still use it to make bone broth but you will need to adjust the lid slightly - “crack the lid” - to one side to allow for some of the heat to escape so as to prevent the broth from boiling. Thanks so much for your comment. I generally don’t add salt to any of my bone broths since I prefer to add it when I use it in a recipe or drink it. Also – as for the Roast Chicken Bone Broth – there is usually a residue of salt on the carcass, skin, etc., so I definitely don’t want to add any more salt. Thanks for visiting and please let me know if you have anymore questions. Glad you’re here!! Great website and thank you for serving people.